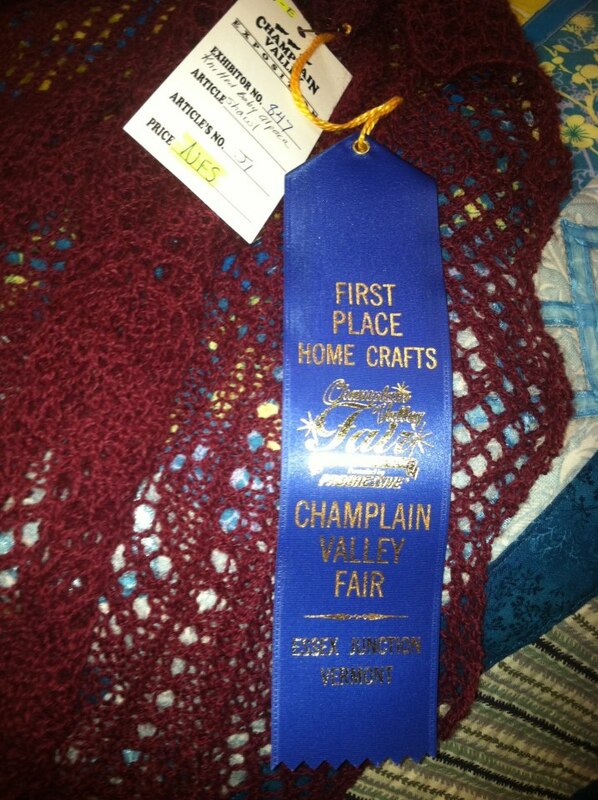 Update #1: My shawl won a blue ribbon at the Champlain Valley Fair! I couldn’t believe it when I saw it, all folded up and looking pretty under the Winner’s Circle banner – I felt like I was dreaming! I took my $6 winnings and had a grand old time at the fair with my friends Liz and Patrick, hanging out in the beer tent, eating all the foods on sale that were bad for us (this took up most of our time), and going on the ferris wheel which was definitely not terrifying. 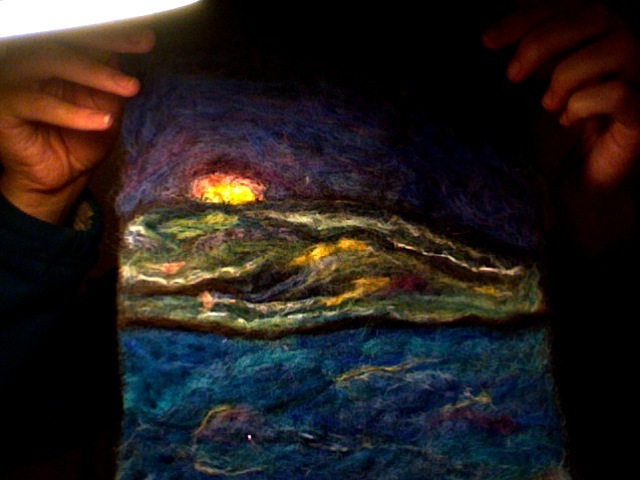 Update #2: My shawl won a blue ribbon at the Tunbridge World’s Fair! 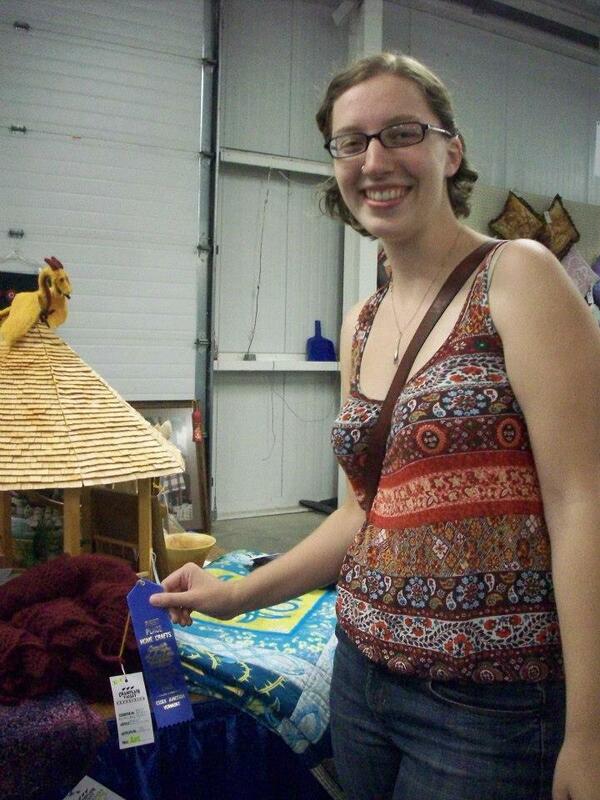 This fair is a little bit different because they don’t give one blue ribbon per category, and that is the best entry. Instead, they judge everything on its own, and a blue ribbon simply means it was of a certain quality. (Red ribbon would mean that a few mistakes were noticed such as the ends weren’t woven in completely, and a yellow might be a bigger mistake like the seams were crooked or the blocking was poor.) My winning check (yes, check) for four whole dollars still sits, uncashed, on my dresser – I should probably head to the bank, get that puppy cashed, and go out and have a rip-roarin’ good time! Update #3: NaNoWriMo (National Novel Writing Month) begins in 24 days, and I think I may pass out from fear/poor preparation. NaNoWriMo is a worldwide self-challenge where you try to write an entire novel of 50,000 words (150 pages) in one month, which means an average of 5 pages per day. This insanity occurs every November and has hundreds of thousands of participants from all over the world. The neat thing about it is the community aspect – you get emailed pep talks from prominent published authors every week, can be ‘writing buddies’ with fellow participants, and most regions have their own chapters that host all night write-ins at local libraries, or other kinds of group support. The purpose is not to have a finished, polished novel at the end, but to have all of your ideas down on paper, that can then be edited and spruced up later. I have wanted to participate in this for six years now, but decided I couldn’t commit to it until I was out of school and had more time. So this, being the first November that I’ve been out of school, will be my first attempt! I am very nervous/excited, and if anyone would like to join me in this “thirty days and nights of literary abandon,” a link to the NaNoWriMo website can be found here, and a link to my personal profile here. Update #4: The Vermont Sheep and Wool Festival was so fun! It took place last weekend in Tunbridge, VT, at the same fairgrounds where the Tunbridge World’s Fair and my shawl were held last month. It was a bit rainy and muddy, but a sturdy pair of hiking boots and a good raincoat took care of both of those pesky little problems, and the rest of the fair was awesome. I used my usual method of taking a preliminary sweep through the whole place, jotting down items/prices I liked, and then at the end mulling it all over with my wallet and going back to pick up the things I couldn’t live without. This time that included some absolutely scrumptious yarn from Nightingale Fibers that was 70% baby alpaca, 20% silk and 10% cashmere, 1300 yards of lace weight for $32. I nearly fainted at that quality and quantity for that price. The stuff is soft as a cloud and comes in many gorgeous color ways – and if you’re not into knitting lace, they have plenty of worsted, sport, and bulky options as well, in addition to their heavenly roving. I chose the color Bluebell, and I can assure everyone that I will be paying these folks a visit again – one skein for an entire shawl! Update #5: I made this. I apologize for the terrible quality of this picture – my camera is currently dead.